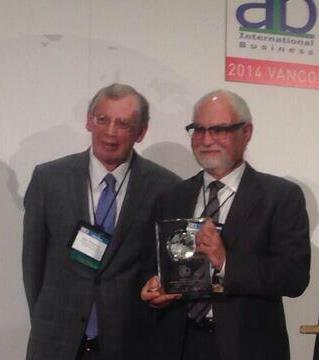 At the Academy of International Business (AIB) conference in Vancouver, June 2014, I had the honour of sharing the AIB Fellows Plenary with Alan Rugman. In his usual eloquent yet provocative style, he challenged all of us to consider the CSA/FSA framework as pivotal tool for analyzing the multinational enterprise, and to consider the regional rather than global strategies as drivers of foreign investment. As usual his contribution provoked most questions - and challenges - from the audience. It was my first appearance on an AIB Fellows Panel, and what nobody expected at the time, it was Alan's last. 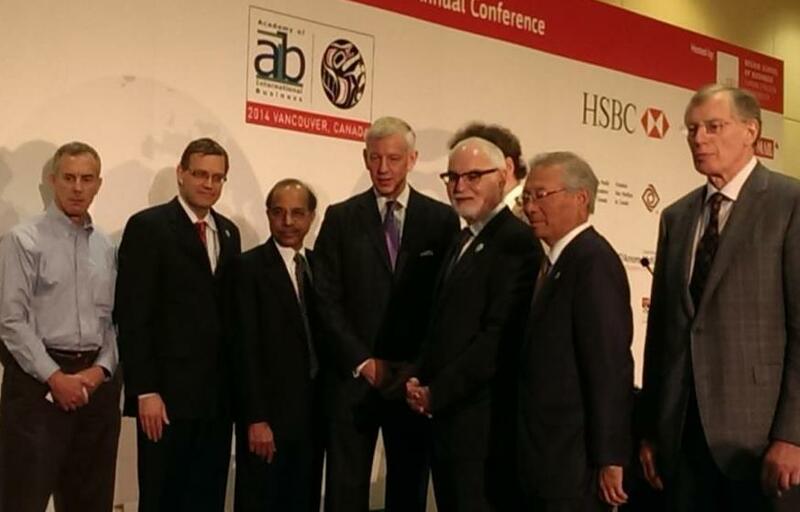 Only two weeks after AIB 2014 Alan passed away. This website is to honour Alan's contribution to scholarly research in International Business, and the 'Theory of the Multinational Enterprise' in particular. Alan has always been a man of debate, in fact he not only liked to challenge other scholars, he appreciated well founded challenges to his own work. The best way to honour his contribution will be to continue our scholarly debates! 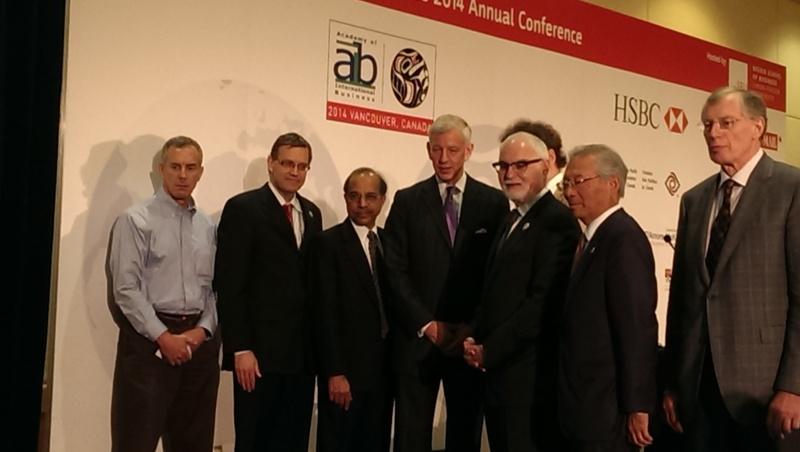 In this spirit, I am here providing the powerpoint presentations of the four panelists of the AIB Fellows Plenary in Vancouver, followed by a few further momentos and links. Rugman, Alan M. (1980), ‘Internalization as a general theory of foreign direct investments: A re-appraisal of the literature’, Weltwirtschaftliches Archiv, 116 (2), 365–379. Rugman, Alan M. 1982. New Theories of the Multinational Enterprise. Taylor and Francis: New York. Rugman, Alan M. 2009. Theoretical aspects of MNEs from emerging economies, In: Ramamurti R., Singh J.V., eds. Emerging Multinationals in Emerging Markets. New York: Cambridge University Press. p. 42-63. Rugman, Alan M., & Verbeke Alain 2001. Subsidiary-specific advantages in multinational enterprises. Strategic Management Journal 22(3): 237-250. Rugman, Alan M., & Verbeke Alain, & Yuan W. 2011. Re-conceptualizing Bartlett and Ghoshal’s classification of national subsidiary roles in the multinational enterprise. Journal of Management Studies 48(2): 253-277. Rugman Alan M., & Verbeke Alain 2004. A perspective on regional and global strategies of multinational enterprises. Journal of International Business Studies 35: 3-18. Rugman, Alan M. 2009. The Regional Multinationals: MNEs and 'Global' Strategic Management, Cambridge: Cambridge University Press. For further publications, and his over 16,000 citations, see his Google scholar site. Left to right: Danny van den Bulcke, Peter Buckley, John Cantwell (standing), Rajneesh Narula, Sarianna Lundan, Alan Rugman.